Nirender stands as a 9'3'' tall Anthro Moose with his antlers. Without he stands at around 8'4''. The antlers however add a great deal of width and are nearly as broad as his shoulders. He has a fairly well built muscular build to him, though a lot of the time it is hidden under the thick, shaggy fur along his cheeks, neck and shoulders. He has several tattooes on him for those that would look carefully. Along his legs there are the tattoos of names written in an alien language, while on his right arm there is the tattoo of an elephant head. 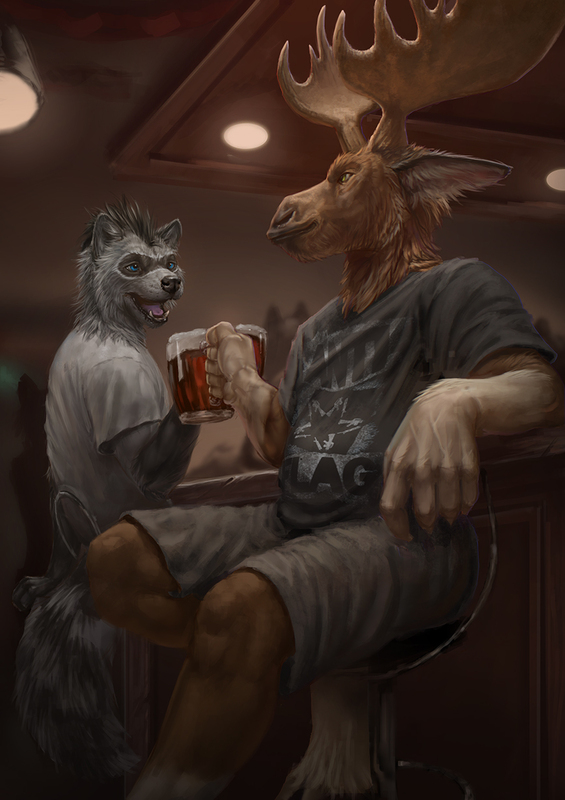 On his left, a vaguely canine-ish head and finally on his chest that of a red tailed deer's head, with a complete 3 point rack of antlers. He also has a small earring piercing on his right ear, where a sapphire pendant hangs. Occasionally if the season is festive enough, he will decorate his antlers with tinsel or other paraphenalia. Nirender's spirit totem has gone through many iterations but now stands as a fairly heavy 'log' of wood some 6 feet tall and four inches thick. It is topped by a peacock feather, the center of which is a transparent crystal. It acts as his 'focus', allowing him to peer into the spirit world and into the souls of those around him. Without hte focus, he is able to sense the nature of spirits around him, occasionally hearing them as well. He is able to sense magic, even when he cannot use it - thus able to spot traps and the like to avoid. capable of basic alchemy and potion brewing. Capable of doing basic general practitioner level modern medicine. Still somewhat inexperienced but in a pinch he's qualified as a paramedic at minimum. Capable of diagnosing magical ailments with a lot more expertise compared to modern medicine! Mostly limited to 'feel' and one-way communication (receiving). Cannot communicate without focus. Often bothered by spirits that have nothing better to do. Has difficulty turning it off, so uses charms to 'blank' himself down. This form has been built with /especially/ strong heat resilience, given he lives with a dragoness. This means that while he cannot really bathe in lava, he is still comfortable around it and isn't terribly burned in brief exposures. He is extra vulnerable to the cold, usually layering up in the winter despite his thick fur. Lashir - the land of beasts and tribes. Lashir is a fractured land full of various tribes that roam it's many forests. Each tribe is lead by a shaman, whom respresents the animalistic God spirit that guides them. Nirender's tribe was that of the Hathi, or Elephant - whose main skill was their knowledge and memory. Unfortunately for the longest of times the Tribes had a great foe: the empire of Man to the East; whose great technological prowess was only kept at bay by the use of the ancient spiritual magics and the dangerous forests themselves. Led by a fierce lich king, eventually this was not enough and they swarmed inwards, bringing with them civilization to the outer realms of the forest. It was only the return migrant of Telia and John that the Empire was broken and the lich king defeated, bringing peace to the forest even if the corrupt civilization crumbled. Nirender's life has stretched many years through very many forms. His actual age is close to three quarters of a century now, but biologically he is closer to 45 due to the shift in bodies. He started off in the Hathi tribe in lashir as a Human - but after displaying magical prowess, was selected to become the next spirit Shaman of his tribe. After a rigorous training process spanning several decades, he took on the mantle of Shaman, being transformed into an Elephant and leading his tribe onwards through calamity and rough times. Eventually he was migranted onto Infinitas, before the rebellion against the Traders where he played the part of healer and spiritual guide. He formed a heavy friendship with Telia, whom he helped support through the rebellion and beyond. His body however was starting to age and the magic coursing through him was causing near permanent damage, to the point where it was nearly agony to use anything. Over the next year, he struck a deal with one of the body changers, Mysteria, to be turned into a vague canine/vulpine like creature, which would allow him to use magic without the excrutiating pain, but to a much smaller degree. This however meant he was disconnected from his animal spirit and totem, which meant that over time he could no longer use magic. However, having been a Shaman all his life, Nirender quite enjoyed the life free from magic and took on a more domestic role as he moved in with Telia, helping to run their pizzaria together. Since then he has taken two more forms - initially he swapped to an anthro red-tailed deer, which was capable of no magic. After discussions with Telia, he eventually decided it was time to go back 'up' in size scales again and swapped to the form of a large anthro moose. This form is capable of *some* weak magic with the use of his old totem, but nothing entirely spectacular. It's main advantage though lies in it's great strength and capability to keep up with the dragoness.